important: Nuts and bolts on your bike should always be tightened to the manufacturer's specifications. Adjusting your rear derailleur can be frustrating. I’m hoping that this tutorial will help you understand how each component of your derailleur works, and how to set up and adjust it properly. Once your derailleur is set up correctly, most future adjustments can be done by hand. Let’s get started! You’ll need a rag, a phillips screwdriver, a 5mm allen wrench, and a light lubricant like Triflow or Phil Wood Tenacious oil. 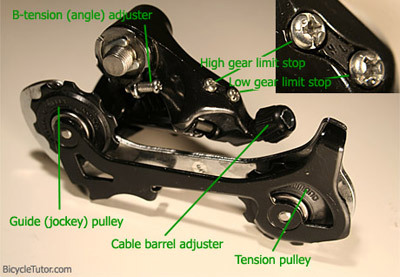 Almost all modern derailleurs function the same basic way. They are designed to move (or derail) the chain from one sprocket to the next. The upper guide pulley (or jockey pulley) moves the chain in both directions. For instance, when you want to climb a hill, you shift down to a lower gear. This pulls the shift cable and forces the guide pulley to change to a bigger sprocket. When you want to go faster, you adjust the shifter to a higher gear. This releases shift cable tension and allows the derailleur springs to pull the guide pulley back down to a smaller gear. Each time you shift gears, the length of chain changes. The lower tension pulley is spring-loaded to take up this slack. There are 3 adjustment screws – the B-Screw (B-tension adjustment), the H-Screw (high gear limit stop) and the L-Screw (low gear limit stop). Adjustments on these screws should always be made in 1/4 turn increments. The B-Screw controls the derailleur body’s angle in relation to the sprocket-set. Shift down to the largest sprocket and check the distance between the guide pulley and the large sprocket. If the guide pulley is rubbing on the sprocket, tighten the B-screw clockwise to increase tension and move the pulley away from the sprocket. If there is a large gap between the pulley and sprocket, loosen the B-screw until the pulley rubs the sprocket, and then tighten it until it just clears. The H-Limit screw high gear limit stop prevents the guide pulley from shifting any further past the highest gear and into the axle. In order to adjust it properly there must be no tension on the lower inner cable. If you feel tension, loosen the cable adjuster until there is none. Now check from behind how the chain is riding on the smallest sprocket. If it looks like it wants ride off into the axle, tighten the H-screw clockwise until it lines up. If it looks like it is rubbing on the next gear, loosen the screw until the chain is nicely centered on the sprocket. Now re-adjust the cable tension until the derailleur shifts smoothly down to the next gear. The L-Limit screw prevents the guide pulley from shifting any further past the lowest gear and into the wheel spokes. Shift down to the lowest gear, step behind the bike, and check how the chain rides on the sprocket. If it looks like it wants to ride into the spokes, tighten the L-screw clockwise until it is centered on the sprocket. If it looks like it wants to shift down, loosen the screw until it lines up. As an extra precaution you can use your thumb to gently push the derailleur body and make sure the chain will not run into the spokes, as this could obviously have a nasty effect on both you and your bike. 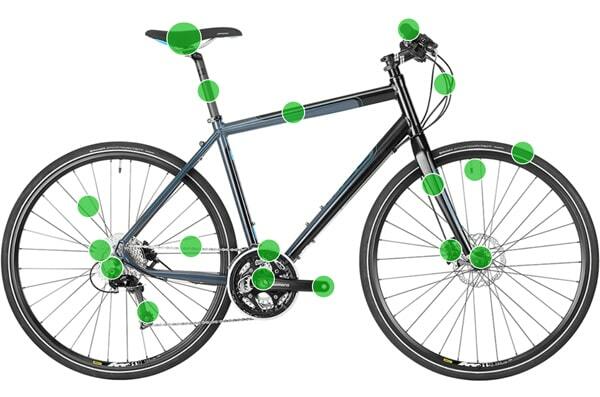 The cable tension adjuster defines how far up or down the derailleur moves. Step back so you can see the chain and sprocket alignment, and then through the gears in both directions, first shifting up two and down one, and then down two and up one. The chain should look centered on each sprocket. If it is rubbing on a larger gear it means there is too much tension on the cable. Loosen the tension by turning the adjuster clockwise. If it wants to jump down to a smaller gear it needs more tension. Increase the tension by turning the adjuster counter-clockwise. You can also use sound to check the adjustment. There is always a base-level of noise that can be heard in every gear. This noise will increase in a slightly different way depending on which way the tension is out of adjustment. If there is too much tension you will hear a metallic rubbing sound, but if there is too little tension you will hear a clicking noise as the chain tries to jump to a smaller sprocket. There is usually a cable tension adjuster on your shift lever. With practice you will be able to make small cable tension adjustments while you are riding. Now that the derailleur is adjusted, always apply a drop of lubrication to the derailleur’s many moving parts. This will help prevent wear from dirt and rust, and it will keep your gears shifting smoothly. Wipe away any excess lube and take your bike for a test ride to make sure all the gears are working smoothly. That concludes our tutorial on rear derailleur adjustments… have fun! A bicycle geek since early childhood, spending his twenties as a mechanic in bike shops. His passions include flatland BMX, unicycles, cycle touring, mountain biking and road riding. Help.. Rear derailleur wrong position? Will Charger Brand Levers Work With Suntour Vx Derailleur?